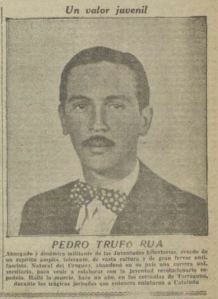 Pedro Tufró Rua was born in Las Piedras in Uruguay in 1907 into a well-off middle class family. He worked first as a public notary, and then studied law at Montevideo University. He joined the anarchist movement in the 1920s and active in the Asociacion Estudiantil Libertaria (Libertarian Students Association) the Federacion Juvenil Libertaria (Libertarian Youth federation) and the Union Sindical Uruguaya (a revolutionary workers organisation founded in 1923 with an anarchist majority). He was an advocate of opening the university to the masses and of autonomy of the university from the State. As a result he lost his university degree in the 1930s during the Terra dictatorship (1933-1938). He then worked as a teacher of history and languages. He was a member of the Comite de Relaciones Anarquista (Committee of Anarchist Relations) coordinating anarchist activity in the workplace and among the masses. This was the embryo of the Federacion Anarquista Uruguaya (FAU) founded in 1926. He was also a member of the editorial group of the anarchist magazine ¡Tierra! in Montevideo. This had been founded in the 1930s by Diego Abad de Santillan, Ildefonso Gonzalez Gil and Francisco Carreño, all of Spanish origin. He was also a member of the Centro Ariel, a space founded in 1929, which was the birthplace of the Federación de Estudiantes Universitarios del Uruguay (FEUU). Together with fellow anarchists like Roberto Cotelo and José B. Gomensoro, he founded the review Esfuerzo (Effort) in February 1936. He was a close friend of these militants and others like Luce Fabbri. A year later he went to Spain in January 1937. There he renewed his acquiantance with Ildefonso Gonzalez, who had been expelled from Uruguay in 1933 and with Diego Abad de Santillan, who had returned to Spain from Uruguay and then Argentina in 1933. He became a member of the Nervio group within the Federacion Anarquista Iberica (FAI) in which Abad de Santillan had a leading role. Here he met leading Spanish libertarians like Pedro Herrera, Fidel Miró and Germinal de Sousa. His desire was to join the militias but his fellow militants persuaded him otherwise. He then became a member of the Regional Committee of the Libertarian Youth in Barcelona and responsible for coordination with the Aragon Front. He also became a member of the editorial team of Ruta, the paper of the Libertarian Youth of Catalonia. In Spain Pedro Tufró got given the nickname of the “Lohengrin of Anarchy”. This was because of his elegance and immaculate dress sense and referred to the dashing knight of the Holy Grail of Wagner’s opera. In February 1937 he headed up the Peninsular Committee of the FAI, which assigned various tasks for different areas of Spain. One of the places he went was Malaga, where days before a large number of CNT militants had been killed by the Francoist forces. On his return in March and April 1937 he participated in the radio broadcasts of the CNT-FAI radio station, delivering a number of passionate speeches. At the beginning of May, possibly on the 8th, he and four other comrades were returning from Alcaniz on the Aragon front, where they had been carrying out a propaganda drive. They were halted at Tarragona by Stalinist militia units. Later his bullet-riddled body was discovered by the highway along with those of Marcelino Silva and Benjamin Fraile. His corpse was identified by anarchist comrades on May 17th. He had achieved the dubious distinction of being the only Uruguayan murdered by the Stalinists in Spain, during the May Days of 1937 which claimed the lives of 500 POUM and anarchist militants.